Heavy infestations of this insect can cause blotchy, deformed leaves and can weaken the tree if infested over consecutive years. 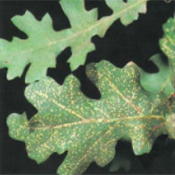 The damage is often misdiagnosed later in the summer as Anthracnose, a fungal disease. 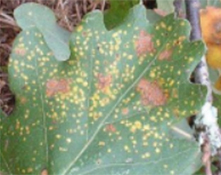 The insect overwinters on English Oak in the egg stage. The eggs are laid in bark crevices and hatch near the time of leaf emergence. The nymphs migrate to leaves and begin feeding by sucking sap from the under side of the leaf. The insect is yellowish-orange, oval shaped and approximately 2 mm. in size. Their feeding causes a very characteristic leaf roll. 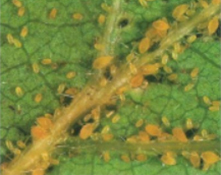 Each Phylloxera feeding site creates a yellow spot on the upper side of the leaf. This damaged tissue will remain yellow for a period of time, then die and turn brown. As the summer progresses, yellow spots turn brown, new yellow spots are formed and brown spots coalesce into brown blotches. This continues to progress as new leaves are formed and quickly infested. The number of generations produced per year is unknown. Ladybird beetles, larvae and adults can usually be found on the infested trees by the end of summer. However, they may not provide enough population control to reduce symptoms to acceptable levels. The insect overwinters on the plant in the egg stage and one application of dormant oil in late fall or early spring should help to reduce the population significantly. Complete coverage of the tree is required. Horticultural oils, insecticidal soaps and approved insecticide treatments can be applied to the lower side of the leaves early in the growing season.